EARTH HOUR 2011 : essential or compulsory? On January 26, 2011 with some of Eco-Informants we have decided to mobilize ourselves for Earth Hour which take place on March 26, 2011 from 20h30 to 21h30. From now on it is only one week. A reminder about Earth Hour : worldwide event for third time. 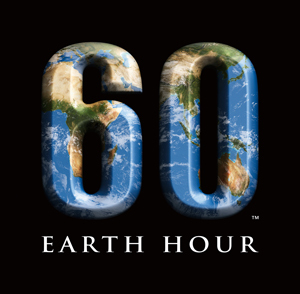 It is an event which direct to mobilize citizen, government, cities and corporations with a simple gesture : switch off lights during 60 minutes (it is the meaning of the logo) to keep the will of anyone against the unsettled state of climate. It clear that switch off lights (!) during one hour will aware all the people which will be directly or indirectly concerned by this event. Yes let’s think during this hour to what we can do without lights. I am un donor of lessons or a truth holder. I did not lure myself, the note you are currently reading just come due to nuclear energy. We will cannot stop all the nuclear centrals from a day to another. But, Mrs Lauvergeon it will be great if on the evening of March 26, 2011 you will just say : here is the plan we will have in the 30/50 years to come, nuclear centrals will be closed , we have found alternative solutions in order to be more close to people who are living on our Earth. And as citizen let’s find alternative to consume differently without to forget our pleasure and fantasy. Am I utopist, next to the plate? I will not answer this question, but the wish to be give more solidarity. It will be a very good thing if we switch off the lights the evening of March 26, 2011 but not only for us, but also for the others.